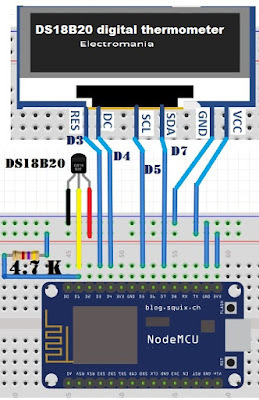 A quick, cheapest and easiest way of measuring temperature with high precision using DS18B20 sensor from Maxim Integrated, 3$ USB to RS232-TTL converter and a windows PC. 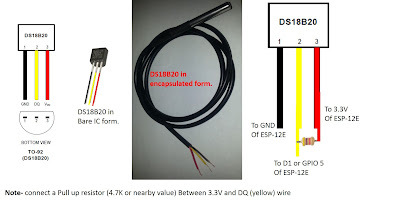 In earlier post I described interfacing DS18B20 programmable digital temperature sensor with ESP8266 NodeMCU board and displaying temperature on OLED display. That required knowledge of programming, basic electronics and required a bit of electronics hardware too. Here, I managed (with the help of several google searches ;)) to interface the DS18B20 with my laptop using cheaply available USB to RS232 converter. And with the help of free software "OneWireViewer" from Maxim Integrated; we can program resolution, view temperature readings or save the data in text or excel files. The best thing is we do not need any microcontroller, microprocessor, Arduino or Raspberry PI etc. [A] Installing drivers for USB to RS232 TLL converter (UTC) with Prolific PL2303HX IC. Getting these cloned, cheap UTC to work in Windows is a bit tricky. We need to have right drivers to get it detected in our Device Manager of windows PCs. The working drivers for windows 7 and 8.1 can be found here. Download this zip file and extract to some known folder. May be these work also with windows 10 etc, I would be happy to know results if someone tries this. (following sequence is for windows 8.1 PC - similar procedure needs to be followed for Windows versions). 2) Open Device manager and expand Ports (COM & LPT) section. Insert UTC into USB port of the PC. 3) After sometime, if drivers for the UTC are not present on your PC, an error will be indicated by Yellow triangle next to "Prolific USB to Serial Comm Port (COMxx)".... Do not Panic. 5) After installation of drivers, Yellow triangle should disappear- note down the COM port number for later use. 6) After installation of drivers for converter, download the OneWireViewer PC interface software from official page of Maxim here. Choose correct operating system of your PC and whether it is 64bit or 32 bit OS. 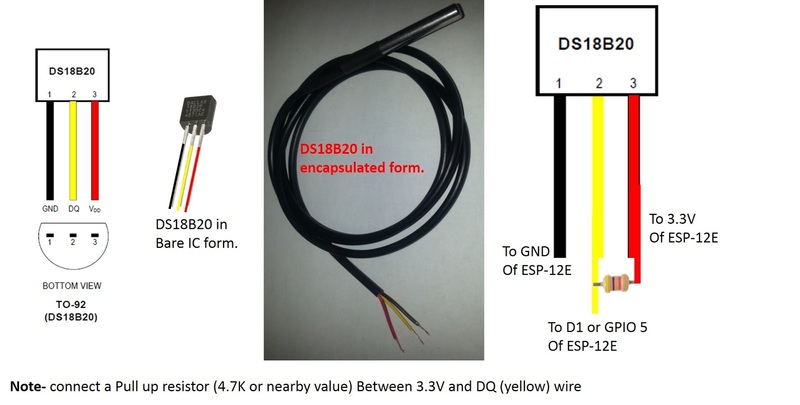 1) Since DS18B20 is a 1-wire device/sensor that can be powered in Parasite mode, I have shorted the Receive (RXD) and Transmit (TXD) pins of UTC and connected it to data or DQ (Yellow wire/pin 2) of DS18B20. 2) The ground GND (Black wire/pin 1) and Power VDD (Red wire/pin 3) are shorted together and connected to ground GND of UTC. Refer my video section here for exact wire connections and pin information. ** First remove the UTC from USB port of your PC during installation of OneWireViewer software. 1) Download the OneWireViewer and drivers from the official page of Maxim Integrated for 1-wire/iButton sensors, here. 2) After installing the software+drivers, Insert UTC into USB port and make connections between UTC and DS. and open the OneWireViewer software. 3) Once software starts for the first time, it asks for the Adapter name and USB port number, refer this section of my video. 4) Insert the COM port number that we had noted in step [A - 5] above and click OK.
5) On the Top left side, you should see the unique 64bit ID of the connected DS18B20, click on that and then on the tab named Real-time Temperature and explore other settings.... to enjoy temperature readings :). 4) 2 Wires, soldering equipment and other accessories. ESP8266 ESP-12E NodeMCU and DS18B20 based digital thermometer displayed in (C/F) on SPI OLED display. ESP8266 ESP-12E NodeMCU and DS18B20 based digital thermometer displayed in degree C/F on SPI OLED display. Programmed using Arduino IDE, Adafruit GFX Library. 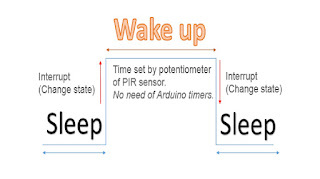 3) Extending battery life or reducing power consumption by putting arduino nano into deep sleep or hibernation when motion is not detected by PIR sensor. 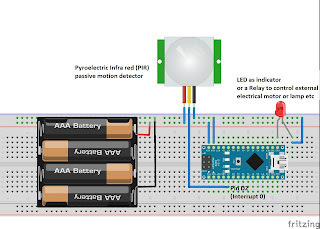 Pyroelectric/Passive infrared (PIR) sensors are widely used in Automatic doors or lights, surveillance cameras, toys, night lamps, automatic cameras etc. We can easily recognize such PIR sensors around us, because these sensors mostly have typical hemispherical dome with honeycomb like small facets (Fresnel lens) all around its body. Rattlesnakes have natural "invisible heat" or "infrared radiation" sensor on its head, It can sense extremely tiny variations in surrounding temperatures. This helps the snake to detect its prey without actually "seeing" it, just by "sensing" the warmth of the body of its prey. 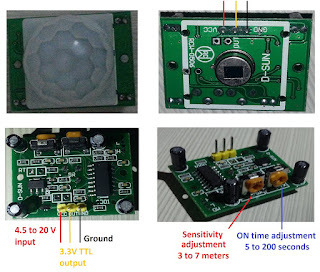 Electronic PIR sensors work in similar manner. PIR sensors are used to generate electronic signal output upon detection of any human/animal movement within the vicinity of sensor's detection range. These sensors detect minute changes in surrounding temperature emitted in the form of infrared radiation (IR radiations) by our bodies. Every object above above absolute zero degree temperature ( −273.15°) emits IR radiations. Special kind of pyroelectric materials are used in these sensors which generate temporary electrical voltage depending on variations in its temperature. Therefore, PIR sensors are called passive sensors, i.e. they do not consume energy for detection purpose; but they catch energy (Infrared radiations) emitted by other bodies . 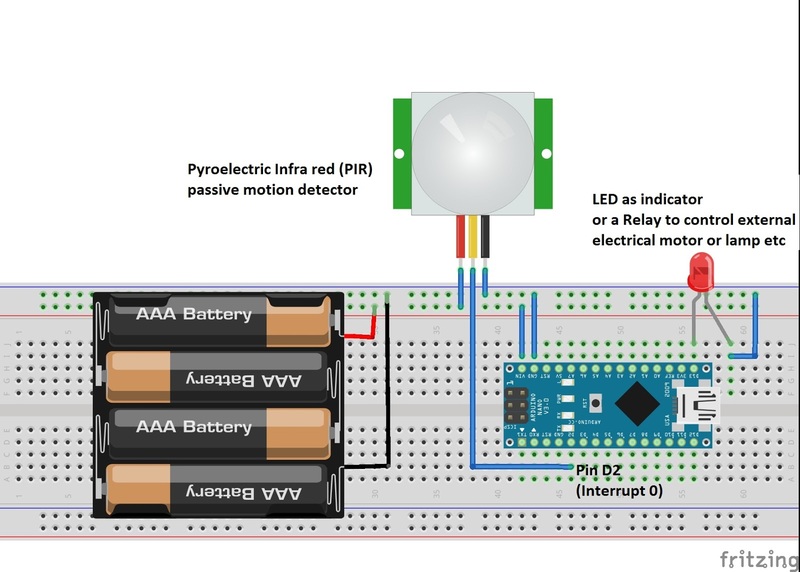 This makes PIR sensors useful for applications where mechanical, magnetic or light sensors cannot be used for one or the other reason. *Operating input voltage between 4.5 to 20 V.
*Predicted idle state current consumption is less than 60 micro-Amps. 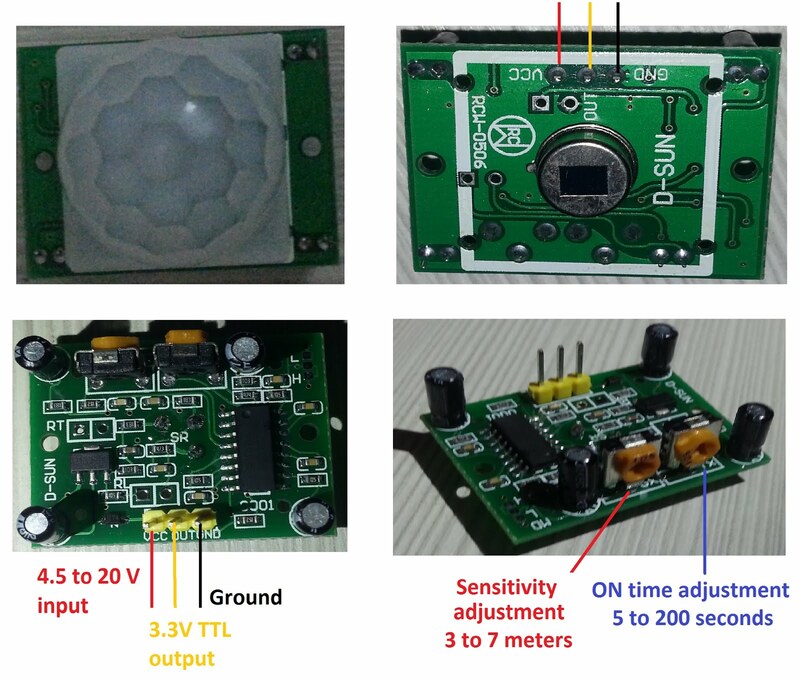 *Output of PIR sensor is 3.3V TTL logic level making it compatible also with ESP8266, arduino Due (apart from arduino uno, nano etc) and other boards operating at 3.3V logic levels. No need of logic level converters. 3) Output remains HIGH for fixed time set by Tx or time setting potentiometer. The output of sensor can be given as intput to microcontrollers, processors, logic level ICs, data acquisition systems, MOSFETs etc. Connections are shown in fritzing circuit diagram on the left. Since, we will be using hardware interrupt of arduino nano board, I have connected output of PIR sensor to pin D2 (or interrupt 0). Arduino nano has two interrupt pins, pin D2 and D3 for interrupt 0 and 1 respectively. We will read PIR sensor output using "hardware interrupt" functionality of arduino. Interrupts help in letting our arduino do its regular job or sleep into deep hibernation mode until some signal is received at its interrupt pins. This lets us use arduino perform other tasks or remain in "nearly OFF state" while waiting for signal at interrupt pins. 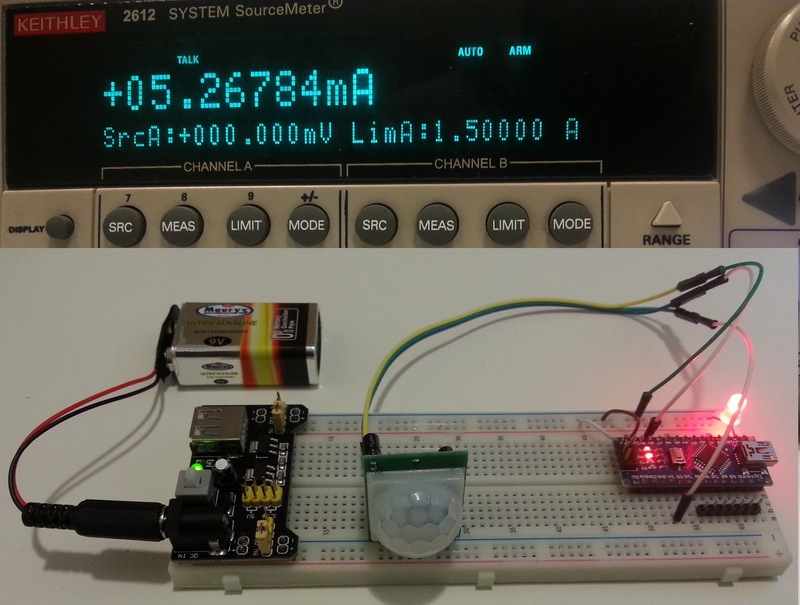 This helps in reducing power consumption of arduino and sensor system. This sketch is given on my instructable page here. 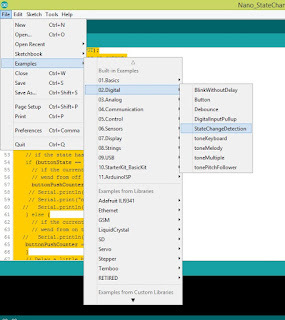 Before going to main concept of using interrupt and power saving deep sleep mode, let us briefly understand power consumption using Pin state change polling sketch. 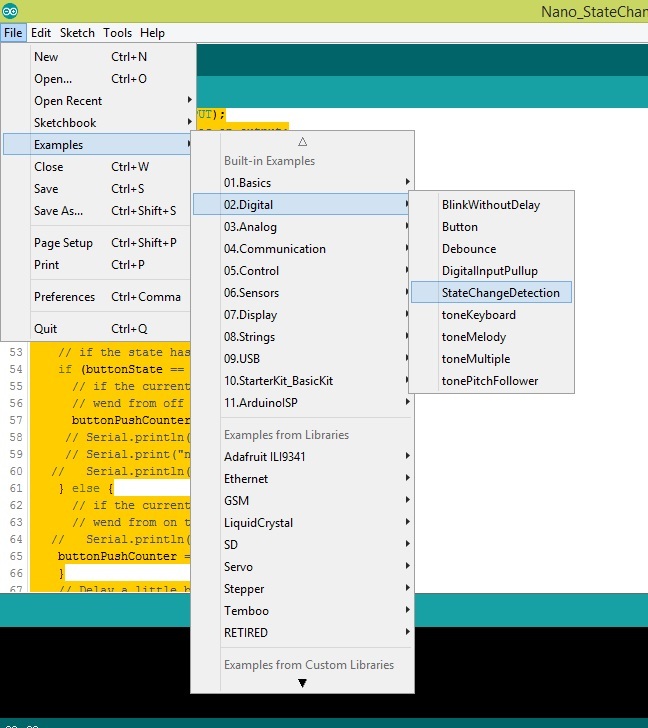 I have slightly, modified the standard sketch available in Examples section of Arduino IDE. In this sketch, we are continuously reading/polling the input pin D2 to which output of PIR sensor is connected. 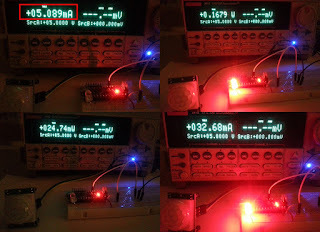 The arduino never goes to sleep mode, ADCs are enabled, hence continuously consumes maximum power. This sketch is available here. and at the end of this post. 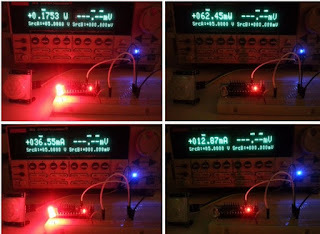 To save power/battery consumption, it would be beneficial to put arduino into lowest power consumption mode i.e. Deep Sleep or Hibernation until PIR sensor detects motion. 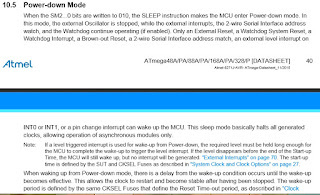 We will achieve this using hardware interrupt and Power Down Mode of arduino board's ATMEGA328P microcontroller. Moreover, we will disable analog to digital converters (ADC) since we do not need any ADC. "The Power-down mode saves the register contents but freezes the Oscillator, disabling all othe r chip functions until the nex t interrupt or hardware reset." 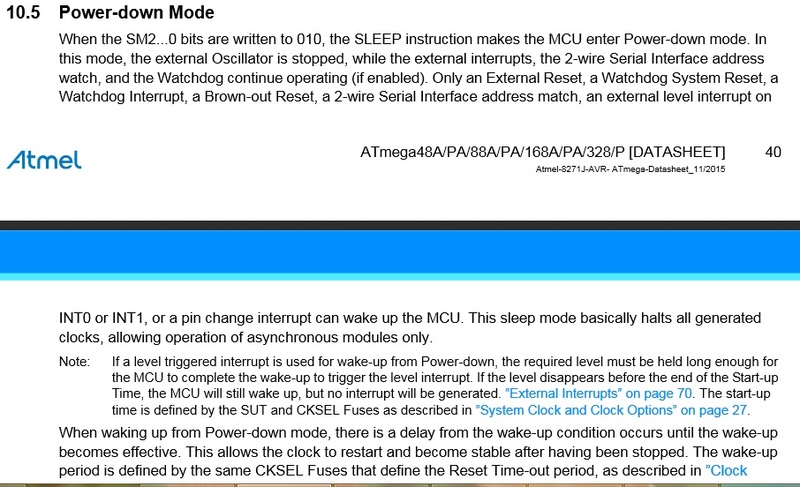 text from ATMEGA328 datasheet. In this sketch, we are using input pin D2 or Interrupt 0 to which output of PIR sensor is connected. (you can also use pin D3 i.e. interrupt 1, and for other boards different pins as mentioned here). 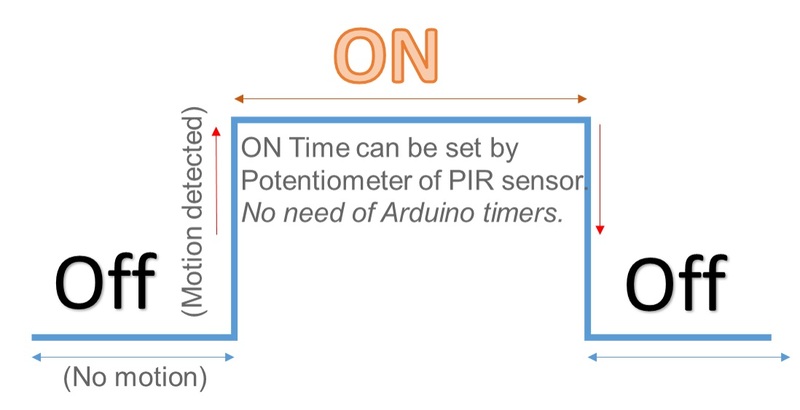 Since PIR detector itself has ON state timer, we do not need any timer from arduino to keep output pin D13 ON for fixed time. The ON time can be physically adjusted using Tx potentiometer, as shown in previous step. 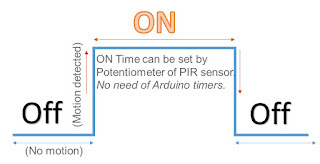 -When PIR sensor detects motion, PIR sensor output state changes from LOW to HIGH. This rising edge signal is picked up by interrupt 0, arduino Awakes from sleep mode, interrupts are disabled temporarily and consequently pin D13 goes HIGH. Once, set time is passed, PIR output again reverts back to LOW from HIGH, this falling edge signal raises another interrupt, putting arduino into hibernation once again. 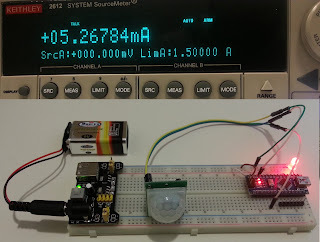 - Arduino on first power ON, blinks LED at pin 13 for a minute, this is just for visual indication of warm-up period required by PIR sensor to stabilize to ambient temperature. -The Arduino is kept into Hibernation until D2 pin is LOW. -we will configure all pins as INPUT, except pin 13 to which we have connected our LED or relay. The current and power consumption reduces drastically using: power down mode, putting all pins to INPUT (or OUTPUT) and disabling ADCs. Note- Although, predicted current consumption in power down mode for ATMEGA 328P is in microAmp range, we are still in miliAmp range. This is because, arduino nano board has power regulators and other components that consume current. 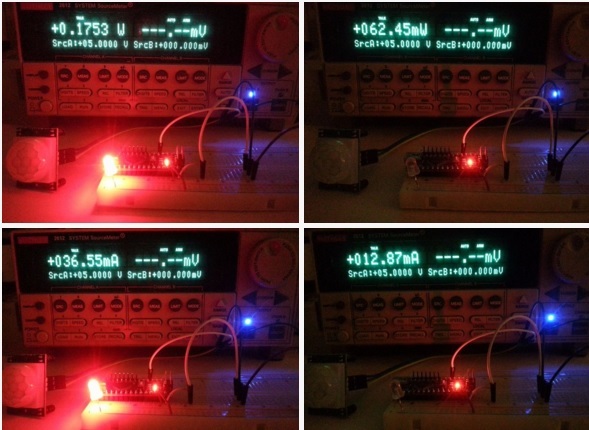 To achieve ultimate lowest current consumption, we will need bare ATMEGA chip with least possible external components. 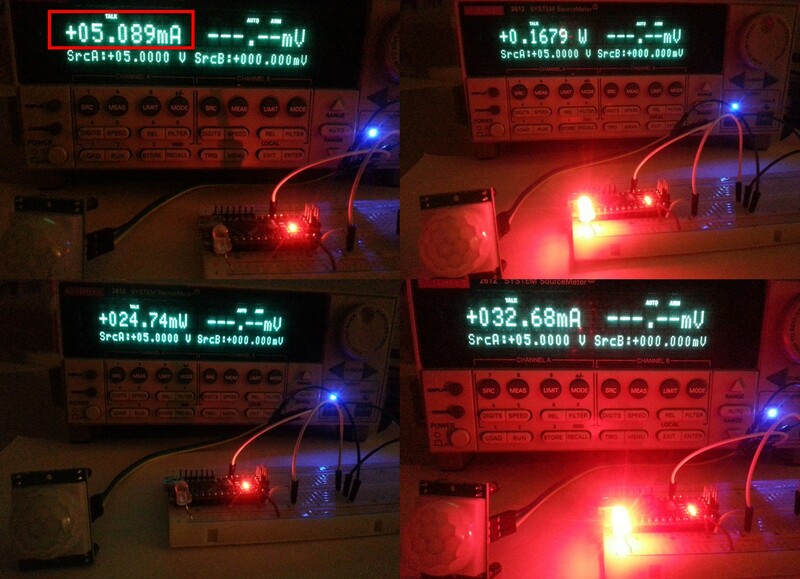 Our goal is to reduce power consumption to lowest possible level for arduino nano development board. Please suggest, if someone has more optimized code for arduino nano to further reduce power consumption. Looking forward for your suggestions... in comments. I am an electronics enthusiast since childhood.... with years of dormancy due to running in the race of getting educational degrees, I am "Back to future", back to old hobby that might help future generation- my 3yrs old kid :). While making quick electronics projects for my kid, I thought why not to share it with other enthusiasts, sharing is- learning is- fun. Recently, I got introduced to new Italian fashion "Arduino" and amazing ESP8266-12E NodeMCU that pulled me back to electronics. Although too busy with my job, I will keep posting quick and fun giving projects using ESP8266 nodeMCU, Arduino, Basic electronic components, some programming etc. And near future share projects useful for research in sensors technology. Electromania - fusion of research, electronics and engineering. Awesome Inc. theme. Powered by Blogger.